When Salomon released the original Sense. 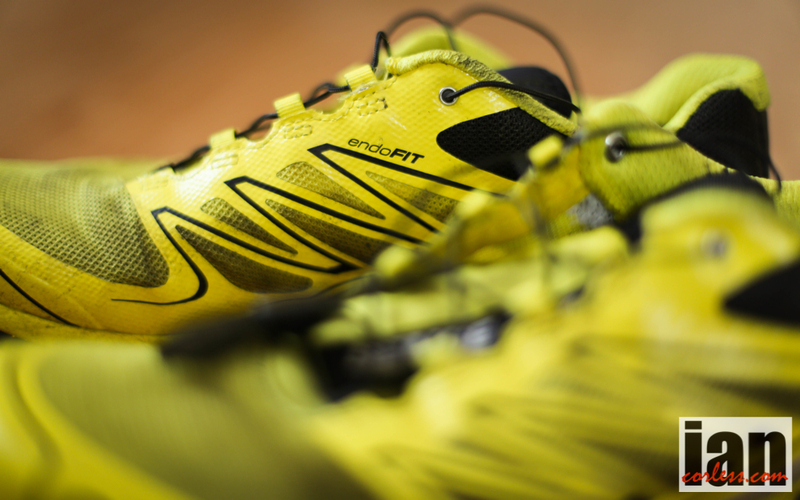 It created a storm of interest, I suppose mainly because a certain Kilian Jornet used them. 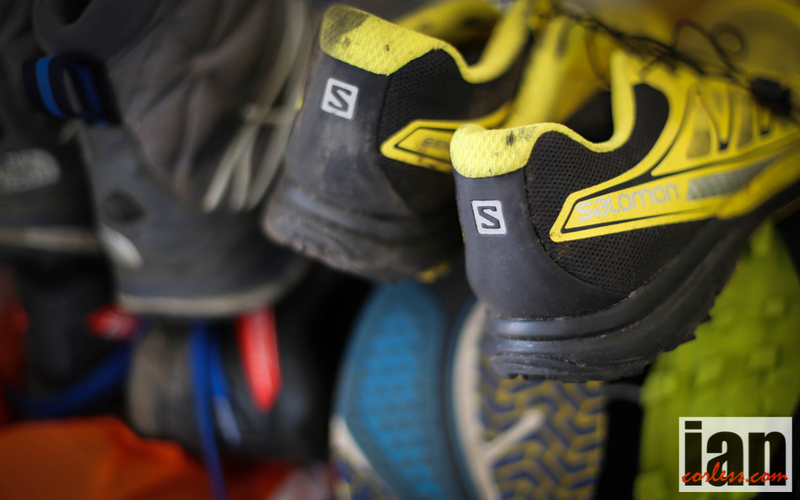 Since the original incarnation we have seen the shoe develop and the recent offerings of the Sense Ultra and the Sense Ultra Soft Ground (more grip) have been a revelation for many a runner. Low drop, arguably the sweetest fitting shoe on the market, light and of course the unique lacing system with garage. The Sense is a shoe I see all the time in races from VK to 100-miles and beyond. There is no shortage of reviews available on the Internet. Although the shoe may not be for everyone, the general consensus is that the Sense is a must try shoe and to be honest, if the snug fit and low drop works for you, it’s difficult to look elsewhere. So, if you are already a Sense fan, I can probably anticipate you will have the original Sense and pair of Soft Grounds or a pair of Sense Ultra and Soft Grounds. They go hand in hand as the perfect combo. Grab your wallet because the new addition to the Salomon family, the Sense Pro is a must have for the discerning Salomon worshipper. It’s worth pointing out immediately, that if the Sense Ultra hasn’t worked for you because of the narrow fit, the Sense Pro may well address that issue. City Trail is a buzzword at the moment, also known as door to trail or road to trail. 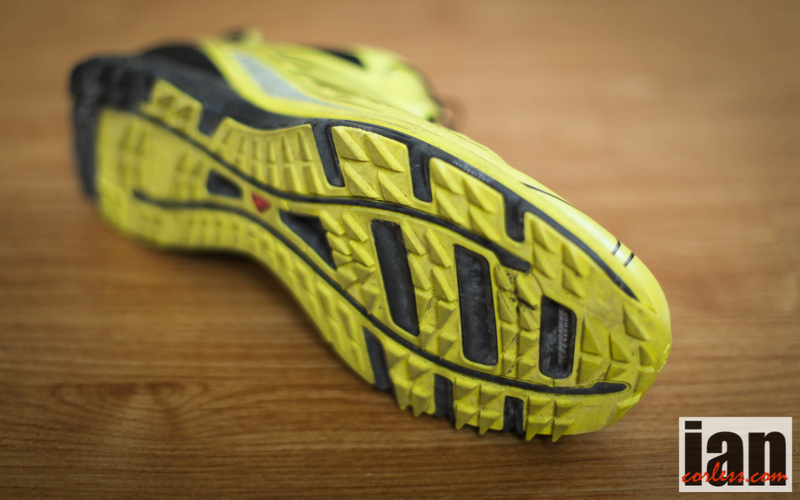 Ultimately, shoe manufacturers appreciate the need and the demand for a shoe that can function on road and trail. So, basically we are looking at a hybrid shoe. The Sense Pro falls in this category. As I see it, the Salomon fellas have taken a mummy ‘Mantra’ and left it alone with daddy Sense Ultra and in time a wonderful Sense Pro has emerged as the new baby in the Salomon crèche. And so on and so on… you get the drift. It has all the Salomon buzz words and as we know, these buzz words work. Slip the shoe on and boy oh boy, slippers come to mind. Of all the shoes I have tested and worn, nothing, nothing at all comes close to the wonderful sock liner of the Sense. Once you have used it and got used to it. You want it in every shoe. It literally just holds your foot in the softest and most seamless grip of any shoe tested. It’s like placing your foot in a velvet glove and then when you tension the lace, the pressure is applied in subtle way that allows no movement. For me, any shoe that has ‘Endofit’ provides the most secure feel on ay surface. In conjunction with low drop, in this case 6mm, you have wonderful contact with the ground. 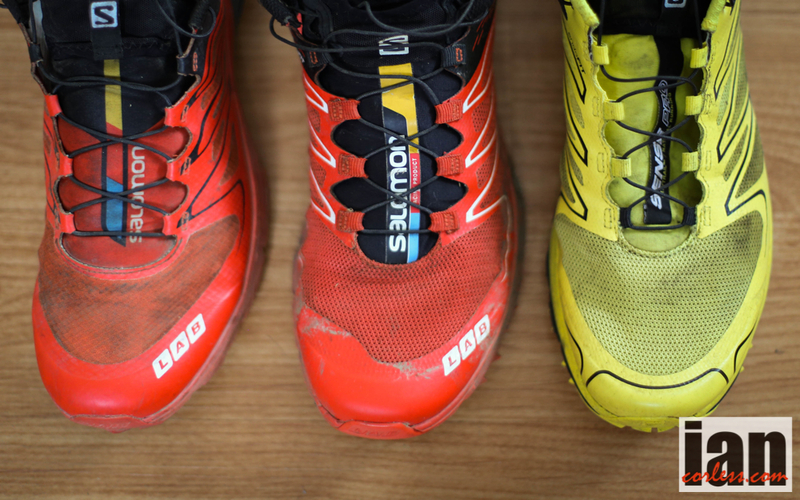 A key feature here is that 6mm drop, Salomon have decided that this is a sweet spot in drop and therefore as this shoe is not an out and out racer, it makes for a perfect choice for longer days or easy training days. If I had to draw comparisons, it’s like wearing a Formula 1 car on your feet; low ride, perfect grip, great feedback and great propriotection. If you haven’t guessed, I love the Sense Pro. Cushioning is 16mm at the heel and 10mm at the front. By comparison, the Sense Ultra has 13mm/9mm (4mm drop) and the SG is the same. Combining elements from other shoes in the Salomon range, the Pro has an ‘OS Tendon’ (A running construction that provides better rolling and a soft rebound, used for running shoes as well as for natural running and hiking shoes in different constructions) and seamless construction. This combination makes the shoe perfect for longer days and of course as this is designed to move seamlessly from road to trail, it offers great protection. The heel is secure and padded. One you adjust the laces and pull them tight, the fit is the sweetest out there in my opinion. It’s the combination of the sock liner, great lacing and snug heel. As I said previously, your foot is held tight. No movement. A plus side of this snug fit is the differences made in the toe box. If you look at the photo below you will see the difference between the Sense Ultra SG, Sense Ultra and the Sense Pro. The Pro has a slightly more squared off toe box with great protection. So, if you have found previous editions of the Sense a little too tight, the Pro may well be for you? Grip is where the compromise is made. That is not a negative comment, after all, the shoe is a City Trail shoe, and so, you are not going to have SG grip. In actual fact, the grip is very similar the Sense Ultra. It’s perfect for dry trails and rocks, they work well in the wet on either road or rocks but if it gets muddy, hold on to your shorts because this when you notice the compromise. Transitioning from road to trail and back again is sweet. I have done some big sections of road and find the transition perfect. I would have no issue going for a road run in them. At this stage though it’s too early to tell what impact that would have on the longevity of the sole. I currently have 120-miles in these and no sign of wear. Sizing is true. I use UK9.5 in the Sense Ultra and Sense Ultra SG and the Pro is the same size. However, it does feel a little roomier. It should though, that is obviously what Salomon tried to achieve with this shoe. Weight is a little more then the Ultra and SG but still lightweight. 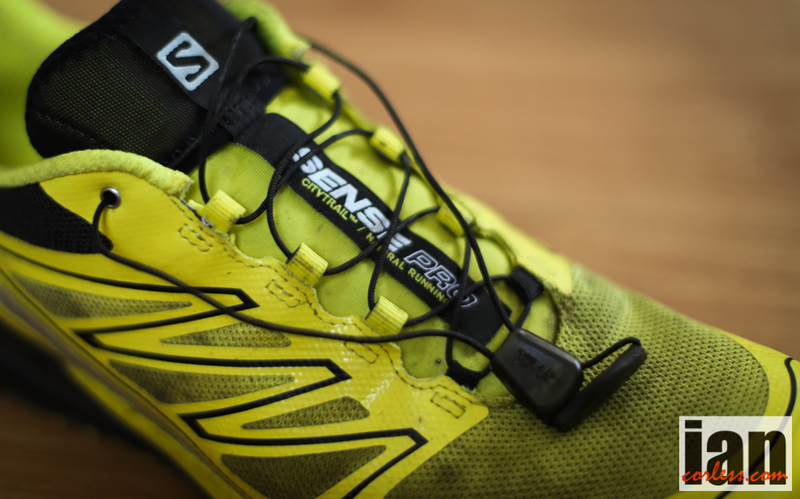 It’s simple really; the Sense Pro has become my day-to-day go to shoe. It has all the elements required in what I need. It has low drop, but not too low, the fit is like a glove, cushioning is a little more than the Sense Ultra and therefore provides just a little more protection daily (without the loss of feel) and ultimately the shoe balances natural running, protection and feel in a perfect package. This entry was posted in Uncategorized and tagged best shoes, city running, city trail, great trail shoes, low drop, road running, Salomon, Sense, sense pro, sense soft ground, Sense Ultra, Trail Running by talkultra. Bookmark the permalink. Too bad the glued overlay, which should protect the seems of the upper from wear, ripped apart on my pair on the second run and only about 30 k (19 mi) in. – I really love my Original Sense (3 Ultra & SG) though, which fit like a glove and feel just perfect. As the new versions (4 and 4 SG) are coming up in Q1 2015 and mine will be done by that time, I will go for these for sure. Plus I had ZERO blisters after the hundred miler! LOVE these shoes! 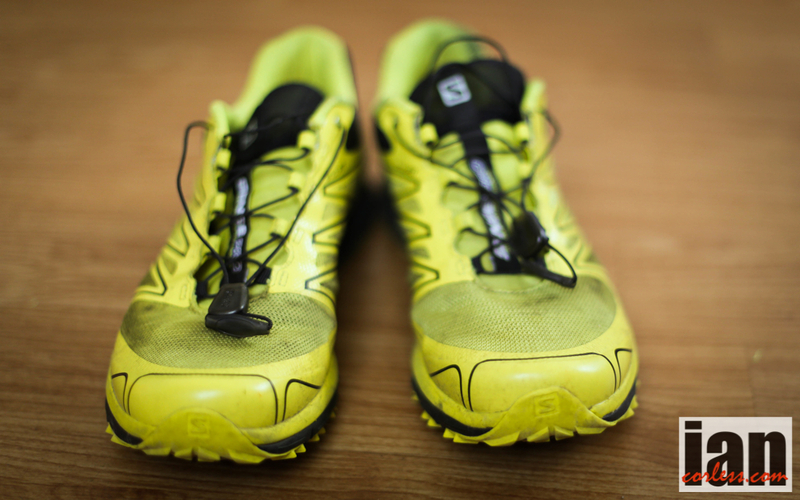 How do the Sense Pros compare to original Mantras in terms of feel, comfort and durability? Are they worth the extra 20-30 bucks? They are superior IMO. A great shoe. I liked the Mantra but love the Sense Pros. Nice review – I’ve not owned Salmons before and needed something that will get me to the trail along bitumen/concrete. My La Sportiva Heleos have been eaten by the flat stuff quite quickly – wonderful shoes for me but no lifespan if there’s any road to be had. Putting the Sense Pros on today was exactly as described – like a velvet glove and I could hear them begging me to find a trail somewhere. Your review has vindicated my rather blind purchase and for that I’m very grateful! What about the size? I wear a 10US for Mantra and X-scream 1, 10,5 for Speedcross. I think they wear a little large, or not? ^ I just got my Sense Pros (US size 10) and I feel they are a bit more roomy than my Speedcross 3’s. The difference is not great though. 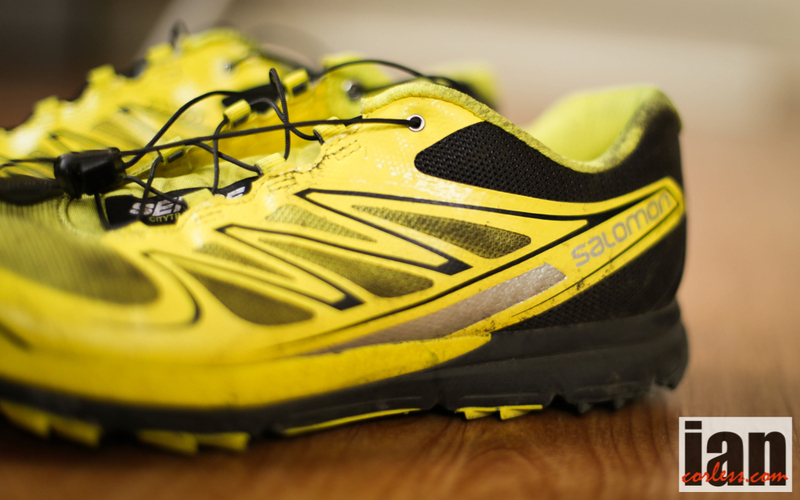 I have heard very good things about Salomon shoes and I was very excited when I go these shoes. I ran 75 miles in them including a couple of 3 hour runs and loved them. 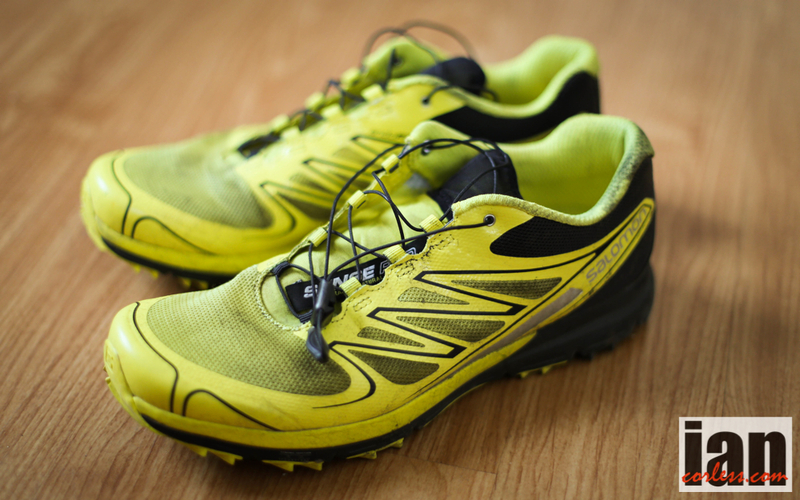 They became my favorite trail running shoes (taking over Brooks Cascadia). I wore them in my next 5 hr long run and noticed third hour into the run that my right toes in one foot did not have any cushion! I took the shoe out and saw that insole slipped backward towards heel! I thought it was weird. I adjusted the insole and continued running. I noticed the same thing with toes in other foot. I had to keep adjusting insoles after that and was frustrated. I was training for the first 50 miler and wanted to wear them during, but after my bad experience with insoles I went with other shoes. I was still optimistic and wanted to like them. So I wore them again in a 4 hour long run. And same thing happened. Insoles keep slipping backward towards heel! That was it and I was done with theses shoes. I like to rotate between few pairs of shoes and put on ~120s mile on them in 9 months. Fortunately I bought them from REI and they took them back even after 9 months after I purchase them.